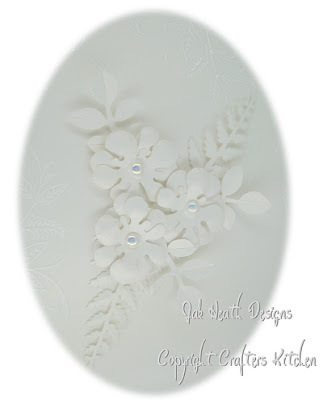 Floral craft blossoms a white base card and Papertrey ink sympathy flourish stamped embossed in white detail powder. I started with a white 14 x 14 base card, I cut a 13 x 13cm white iridescent card and with versamark stamped the flourish then added the white detail powder and heat embossed, I glued this onto the base card and added small pearls to the corners. Using a splat and a funky flower punch I made the blossoms and added bigger Mother of Pearl gems to the centers then punched out the leaf and fern shapes and scored the veins with a DEET tool. If you click on the image you will see the embossed flourish a little better as this was very difficult to photograph. Stunning, Elegant, Classy need I say more! Another beautiful card Jak, well done. Well, I have been "stalking" this blog for quite some time and it's a GREAT blog . . . BUT . . . this STUNNING and BEAUTIFUL card has prompted me to leave a comment at last. The blog AND the white floral card are SIMPLY GORGEOUS and very inspiring. WOW!! I just love the simplicity of the one non-colour! So many ideas have sprung into my head from looking at this. Absolutely beautiful card. You must have so much patience to make works of art like this. Absolutely STUNNING! Thank you for sharing. You are truly patient! It's yet another stunner Jak. I love the simlicity of this card, very elegant and beautiful. Jak, this is so beautiful. I hope the quiting smoking is going well for you! 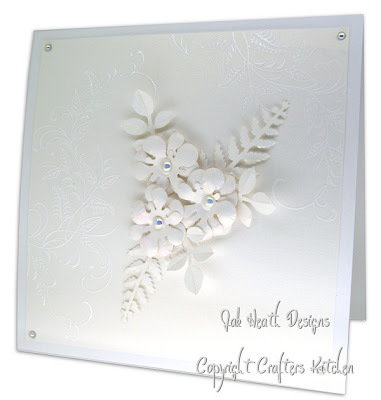 A stunning card Jak, the white embossed stamping on the white card gives such an elegant look to this. This is so beautiful - I love the 'white on white'. Just beautiful Jak! I love it. Oh Jak, i just love your punch art and this one is a cracker, it's absolutely beautiful. Wow Jak, it is completely & utterly STUNNING! OOOOHHHH!! AAAAHHH!! ooooohhhhh! just stunning Jak. Maybe I am odd Jak but I think that would make an absolutely stunning Christmas card. Gorjus cards Jak. I love the punch art cards. I would love to be able to do that. What a beautiful card. I just found your blog and am definitely adding it to my favs. What is a deet tool?